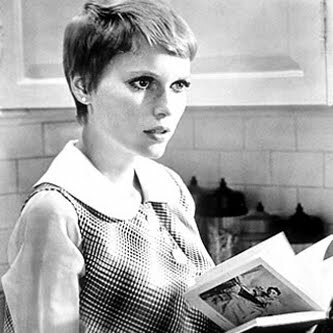 Since getting my pixie cut, several people have made Mia Farrow (circa Rosemary's Baby) references. In this '60s top, I feel like I actually look the part today. I haven't seen that movie since I was a kid. I should really watch it again. The rainy weather has made it difficult to be a good blogger the past couple of days. I had a post written in my head yesterday and then couldn't even get an adequate picture taken. Today, I clearly went for a super simple, no-fuss outfit. But, I'm feeling good about this weekend: I have new shoes coming in the mail tomorrow, and summery weather is on the horizon! Wow I love that jacket on you. Honestly though, I just don't think I've ever seen anyone suit so many haircuts so well. I absolutely love this cut on you, and yet somehow you also really rocked the long long hair! Such a pretty outfit! Simple really is best sometimes. Congrats on the blogger of the day as well. So, when can we expect to see your Answers Part II? it's so funny how the pixie cut translates differently on different gals! i definitely see mia farrow today! You look totally adorable as usual... I am really loving the pastel pink combined with the black here. The style of your jacket is just... sweet! Like sugar and cotton candy, sweet. Also... the resemblance between the two of you is rather striking. You should do a post where you try to do her make-up just like hers—I bet we couldn't tell the difference! Oh Mia Farrow, one of my favorite style icons!!! You totally look like her in this look! If Rosemary's Baby didn't freak me out so much, I'd watch it once a week. I love the cinematography. I agree with The Daily Fashionista: if 'Rosemary's Baby' wasn't so disturbing I'd watch it all the time just to see how cute Mia is in it. And you both rock the pixie cut! Great weather is coming, cant wait! Mia is a good comparison, she was darling with her pixie cut! 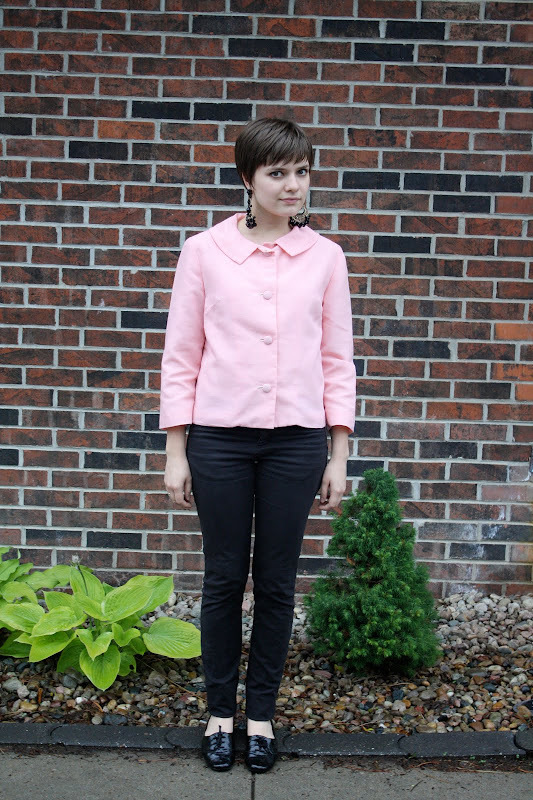 Vintage giveaway on my blog, check it out! Those earings look so vintage, and expensive. I love them. You look so classic as always! i definitely see the resemblance. rosemary's baby scared the bejesus out of me as a kid. i didn't sleep well for weeks! it's hard to deny your resemblence especially with that photo. That haircut really looks awesome on you. Definitely Mia Farrow-esque. People always associate a pixie-cut with Mia. You might not remember, but the movie is really scary! More than people expect. Ruth Gordon is terrifying. You look so adorable! I love your pixie hair cut. Great dangly earrings! Love the pink jacket. Your haircut is really lovely on you. You actually look a lot like Mia Farrow! Do you think you'll keep the haircut or try to grow it out? I love the outfit! 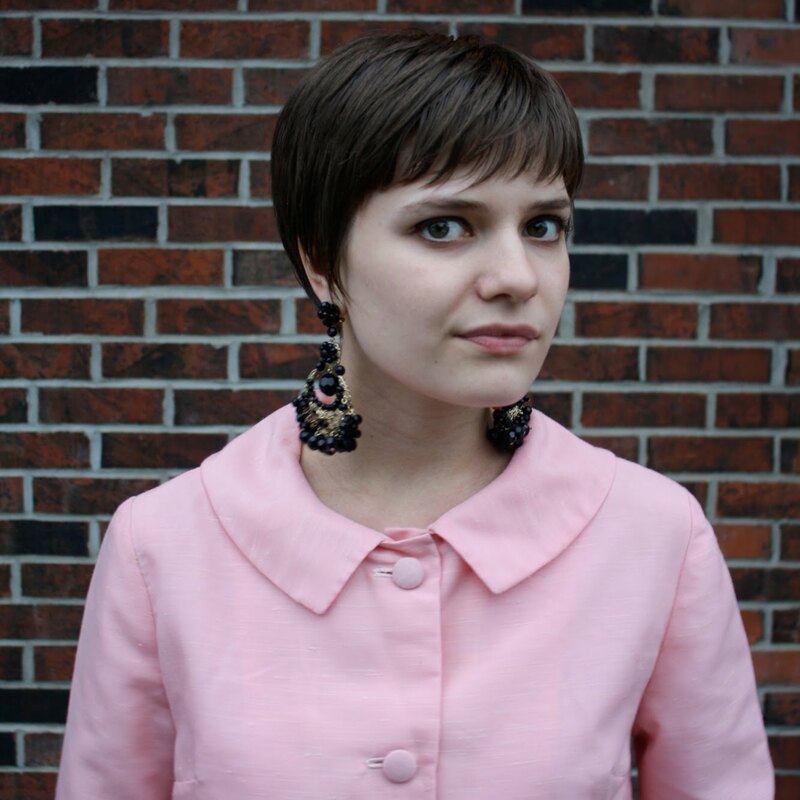 With the pixie hair, it really does give you a Mia Farrow vibe. Ooh, you are totally channeling Mia!! I love this! i love your haircut. it is very vidal ala mia in rosemary's baby. what a creepy movie!